Below is the basic information of 3D Dental X-Ray, you can click on the topic to read more. How does 3D dental x-ray work? How is 3D x-ray different from 2D dental x-rays? 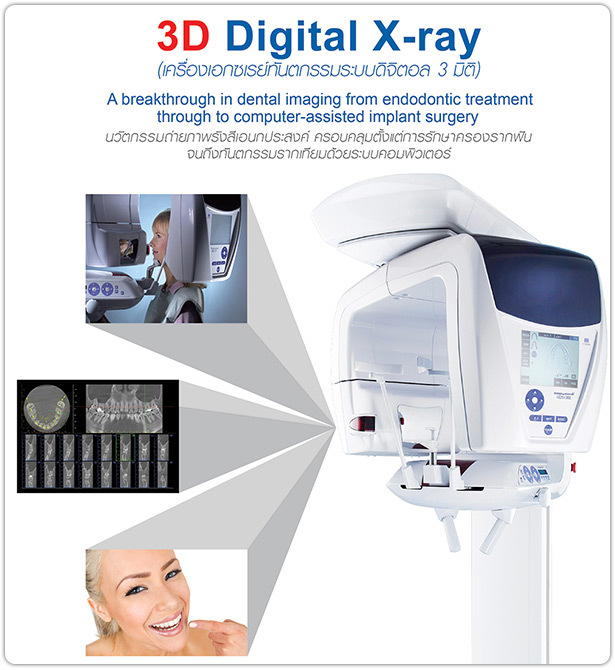 How is 3D x-ray different from ordinary dental x-rays? The 3D ConeBeam Imaging system is basically a digital x-ray scanner mounted on a rotating arm. (Like a digital camera, it uses digital technology to record images instead of old-fashioned film.) It’s called “ConeBeam” because the scanner projects x-rays in a carefully controlled, cone-shaped beam. Your specialists can then call up whatever views they need on a computer monitor: 2D, 3D, “panoramic” views of your entire mouth, even sequences like pages in a book. They can view your images from any angle and in different magnifications, to see the relationships between bones, teeth, airways, nerves and tissues; to plan or evaluate your treatment. And while 3D ConeBeam Imaging produces the same kind of high-quality images as a CT (CAT) scan, it does so with less radiation. 3D x-ray provides you, as a dentist, with the most detailed information for a more accurate diagnosis and more precision in the treatment. 3D x-ray provides you with a more complete view of the facial anatomy – from almost every angle and perspective. What you would never see with 2D images. The fact that you can show your patients 3D x-ray images makes your patients more easily convinced to opt for a treatment and also more satisfied. 3D x-ray is quick and easy: in only 10 seconds, you will acquire a complete overview of the oral, jaw and dental area of the patient by means of a quick scan. You can use this precise and much more comprehensive information to advise your patients even better than before. The service center is Dental Center of Bangkok Hospital Phuket.